Second of all: I DID IT! I made it through my first 31 days series! Thank you so much to The Nester for encouraging all of us who participated and for giving us all this wonderful opportunity! I have to say, I truly do feel more together. I feel organized and tidy. I know that it won’t always be like that. Things may fall out of line (or out of a closet) on occasion. 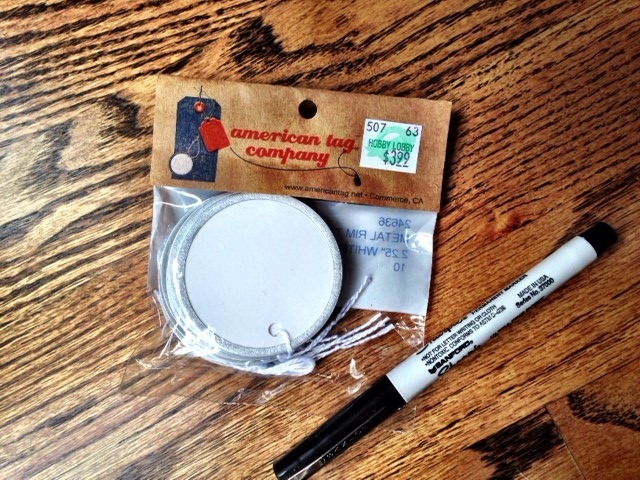 But I have the right tools in place. My pantry really is more organized. I can actually find stuff in my closets. I haven’t forgotten an appointment all month! So, in honor of the 31 Day to Getting it Together, I would like to recap my Keys to Getting it Together or what I have learned. 1. Do Not Procrastinate! Don’t leave the dirty dishes in the sink overnight, just get it done before bed. 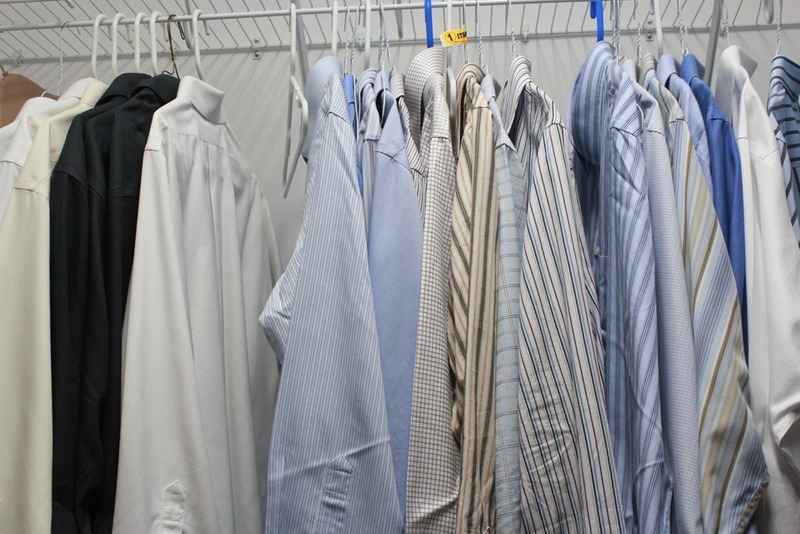 Don’t say you’ll get to the laundry tomorrow, it WILL multiply in 24 hours! Muster the energy and just get it done. It really helps! 2. Just Do It! Don’t think about it, just do it. Plan and execute. If your plan doesn’t go perfectly the first time, you can try again but at least you have a starting point. And you can do it. All of my tasks are quite manageable. They seem large at first but they really are doable. 3. The Law of Physics Applies! You know the one, “an object in motion shall remain in motion….” Once you get started, it’s much easier to keep going. You pick up momentum and it becomes enjoyable because you are accomplishing something. Yes, I just went all Big Bang Theory on you. Sorry. 4. 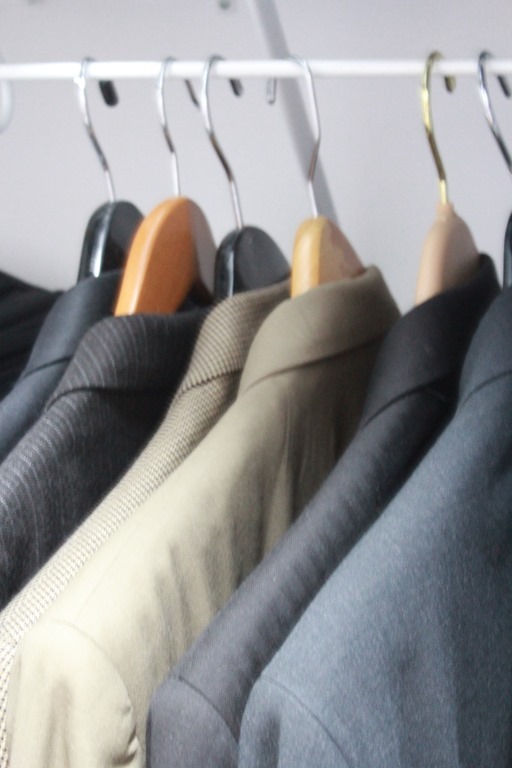 Look The Part – get up, get dressed, look your best! It helps you to feel motivated and confident and ready to tackle any challenge. 5. Have A Plan (but know that plans get broken) – It is always easier to tackle a challenge when you have a plan. But sometimes the best laid plans need to be changed. We learn from our mistakes and set-backs (hopefully). And they help us make better plans in the future. 6. 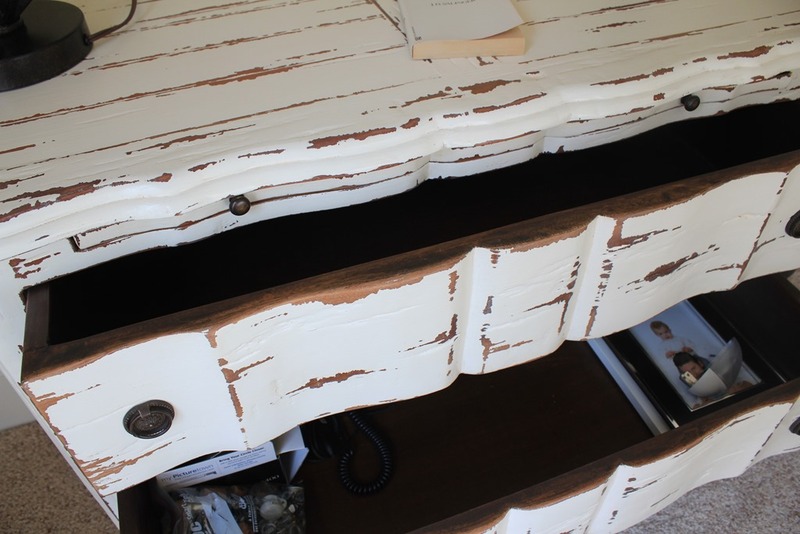 Embrace the Chaos – the house doesn’t stay messy forever. Your children are only young once. You only have one life, and if it is crazy then it is full. Enjoy it all. 7. Get Plenty of Sleep – When you are tired, you can’t get anything done. When the whole family is tired, it’s a disaster! Things are left undone, everyone is cranky, important events are forgotten. Seriously, sleep is sooooo important! 8. Enlist the Entire Family – Chore charts are back! The kids have to chip in. When the spouse looks at you and asks why the house is a disaster, hand him a list of stuff to do that will help. If even one person isn’t on board with keeping it together, the whole thing will fall apart. 9. 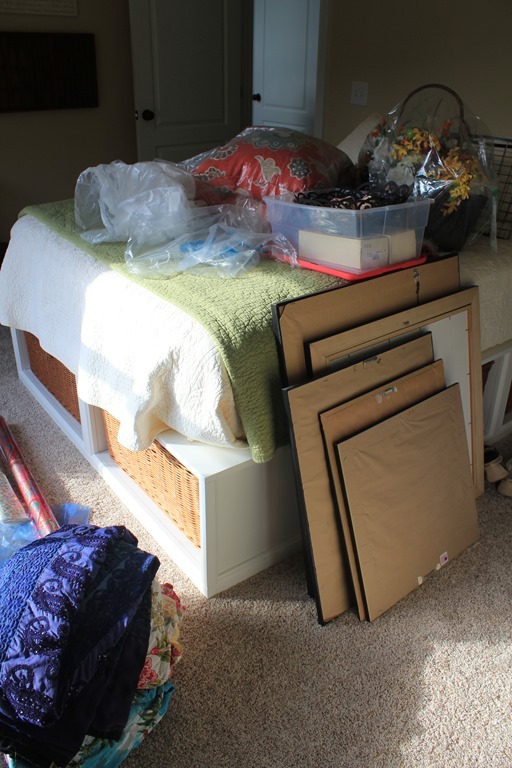 There will always be more – There will always be more to clean, purge, organize. And if you are like me, you will look forward to it. 10. Be Proud! – You have accomplished a lot! Take a look around and give yourself a pat on the back once in a while. It all got done! Considering this is the end of October, the holidays are just around the corner. And knowing that we will have guests, I figured I needed to give them a place to stay. But the closet was overflowing and the little dresser in there was full of my junk. I went into that closet, guns blazing. There was going to be room in there for our guests if it was the last thing I did! I took so much out that I couldn’t believe it had all fit in there! I have a love of fabric. I buy remnants that I think are beautiful. I’m sure I’ll come up with a use for them someday, but they were just stacked in the closet. 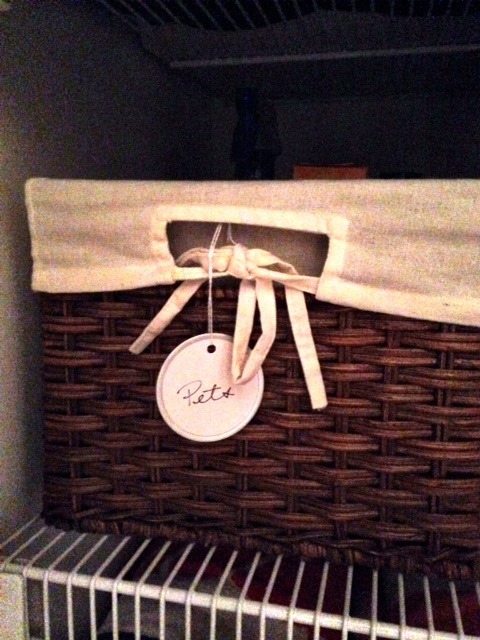 I decided to use the amazing storage in the Stratton Bed from Pottery Barn. 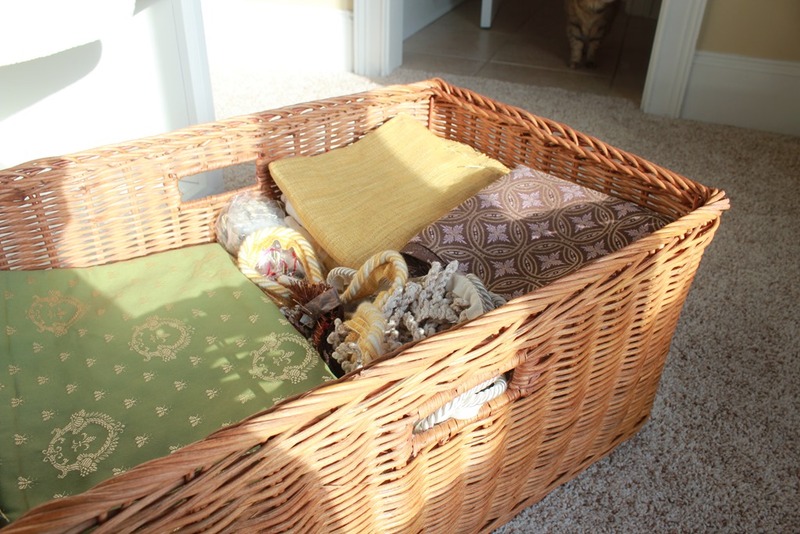 Now all of the fabrics and trims are tucked away in a basket that fits neatly under the bed. 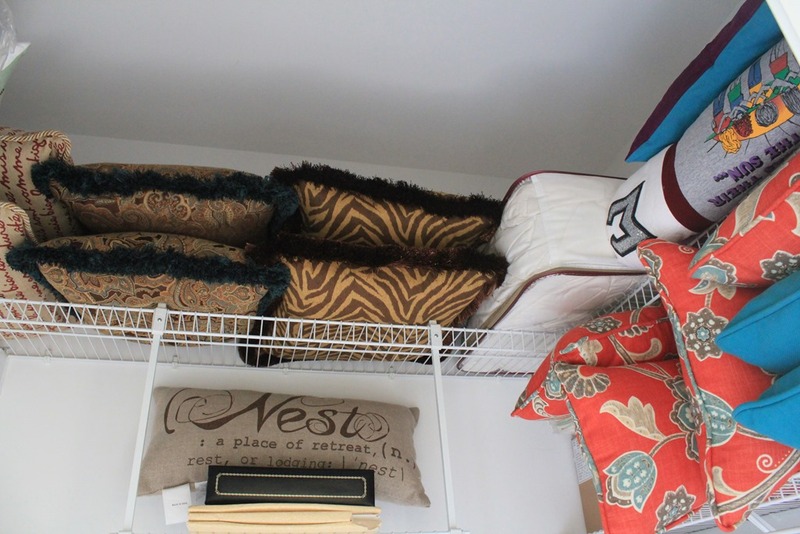 I stacked all of the throw pillows on the top shelf. I like to switch out my pillows for the seasons so I have a lot. And those aren’t the type of things you like to put in the attic (read: dust and bugs). 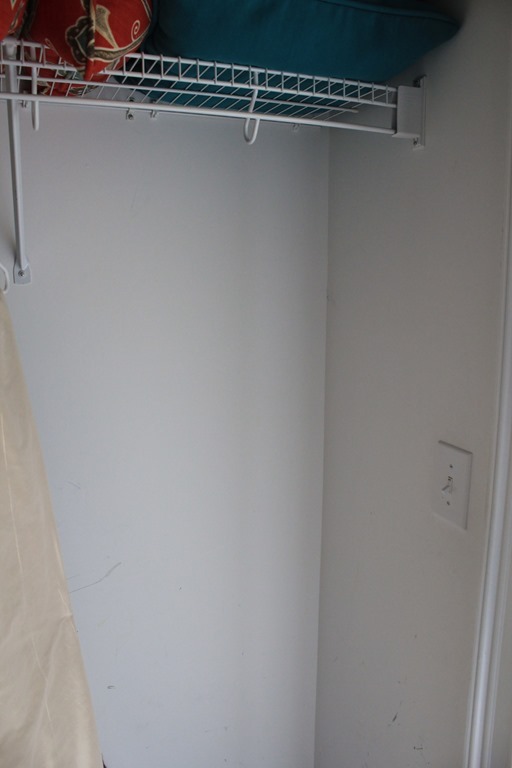 Now there is actually space for guests to hang clothes and put folded clothes! 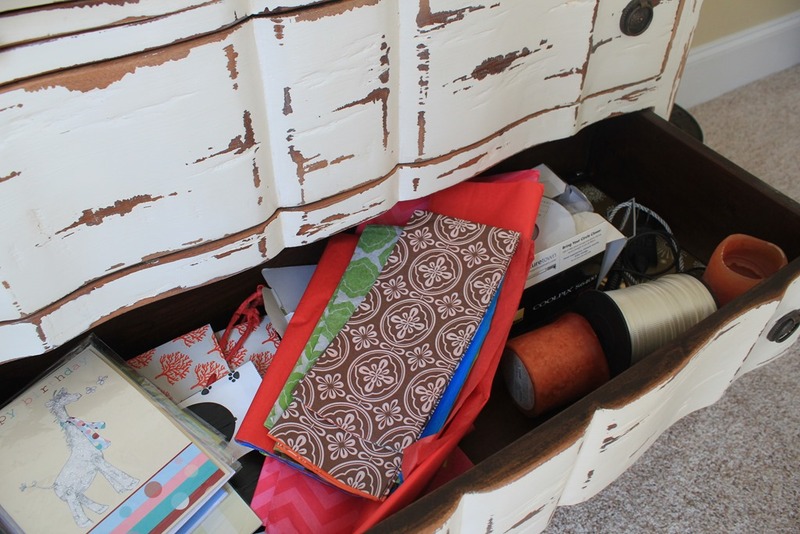 The dresser was mostly full of wrapping paper and ribbon. 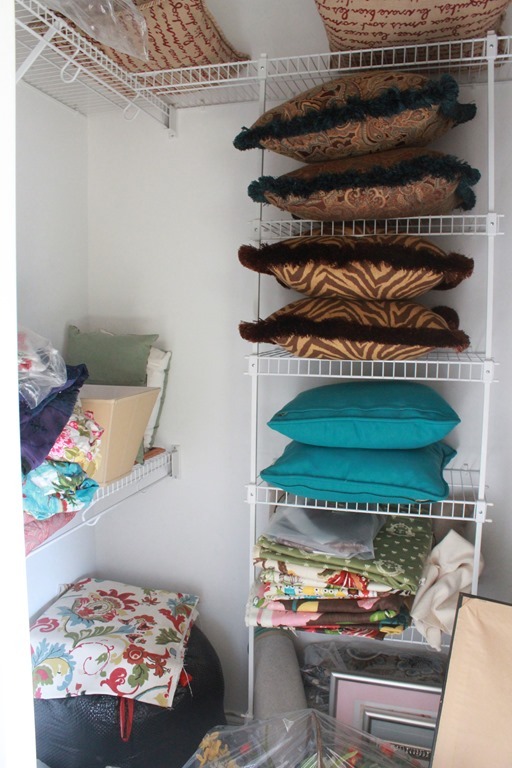 And I found new places for all of that so that guests can put items away. The guest room is almost ready. 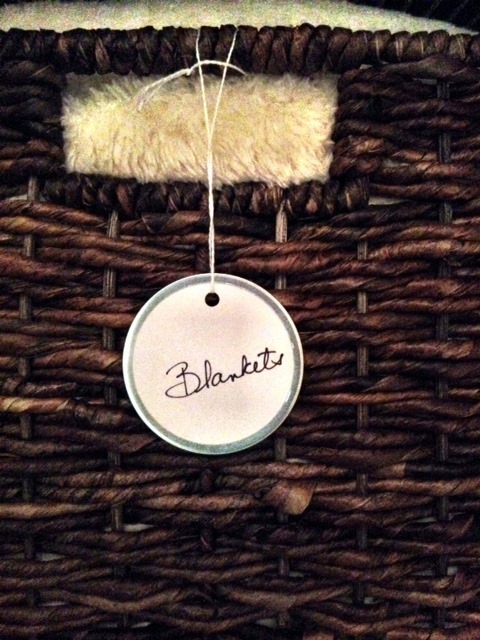 Stay tuned after 31 Days is over for a post on making a guest suite inviting. It’s finished! 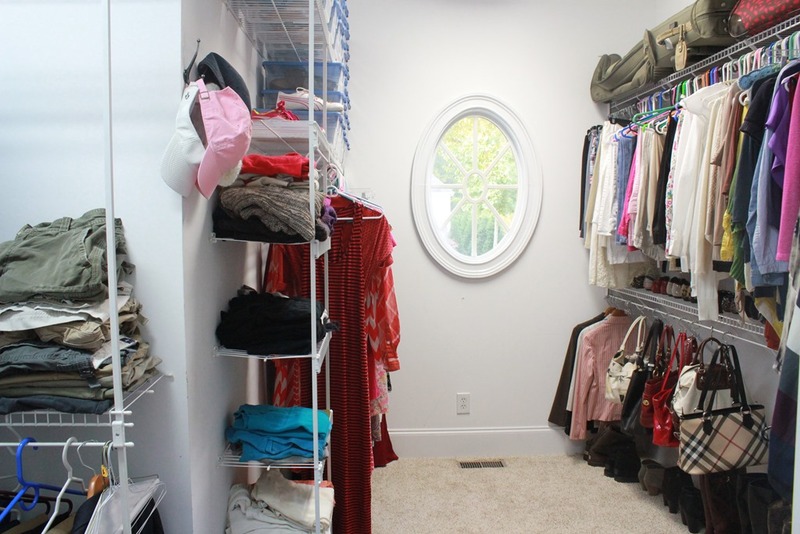 My master closet is finished! There aren’t shoes all over the floor or clothes half hanging off of hangers. It looks colorful and bright not scattered and cluttered! Yippee! 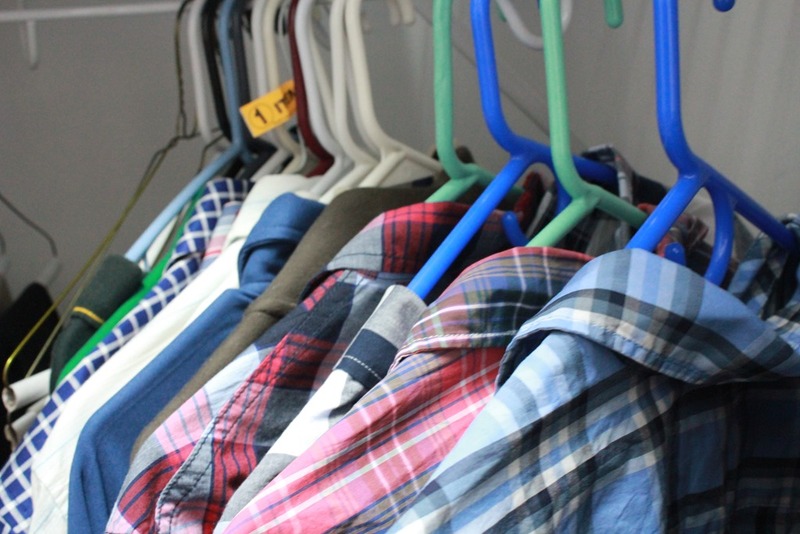 I took some advice from some other bloggers and grouped my clothes by color. It makes them feel very bright and cheery, like staring at a rainbow. 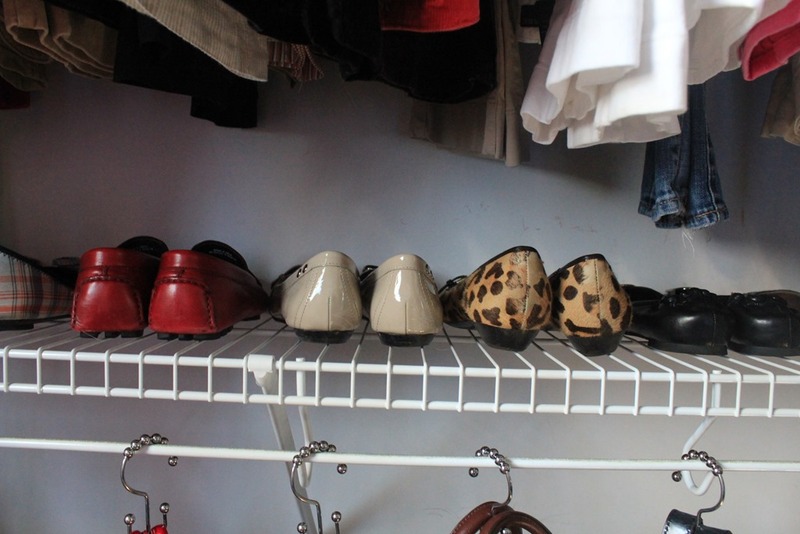 The shoes are in boxes on the shelf and the purses are still hung. 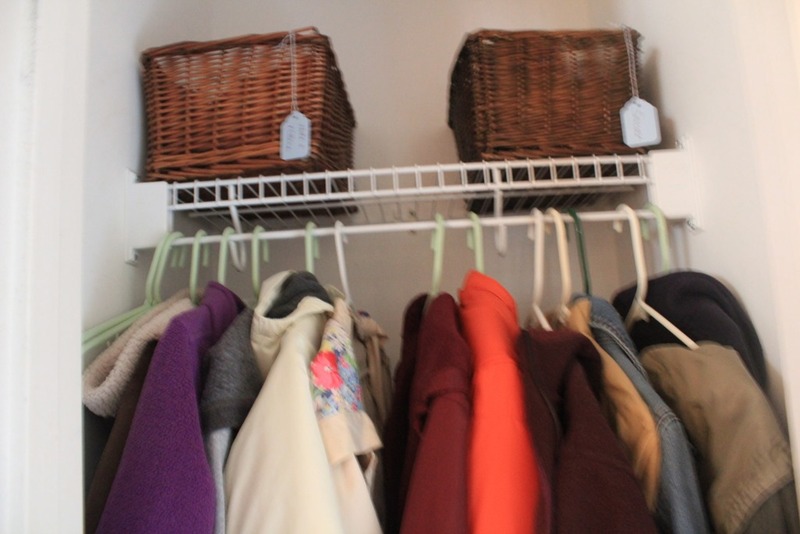 I have room for my sweaters after moving some other items to the armoire. 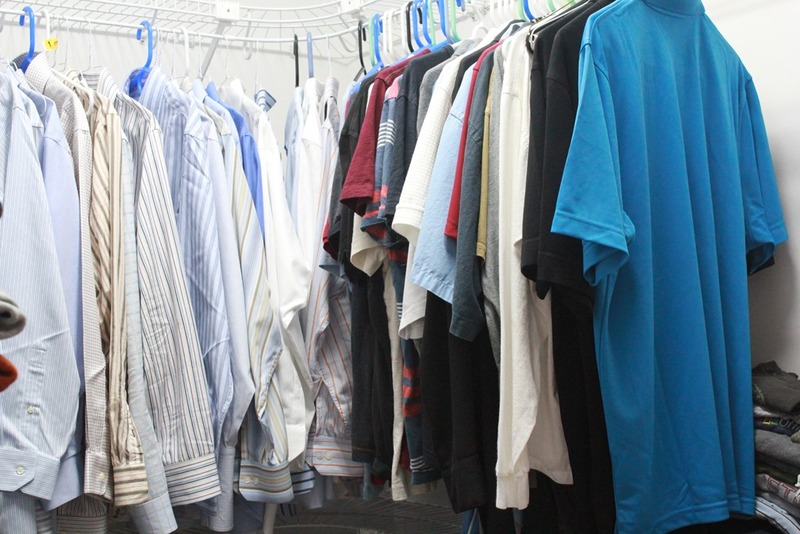 The other half even helped out by putting all his work clothes on one side of the closet and casual clothes on the other. 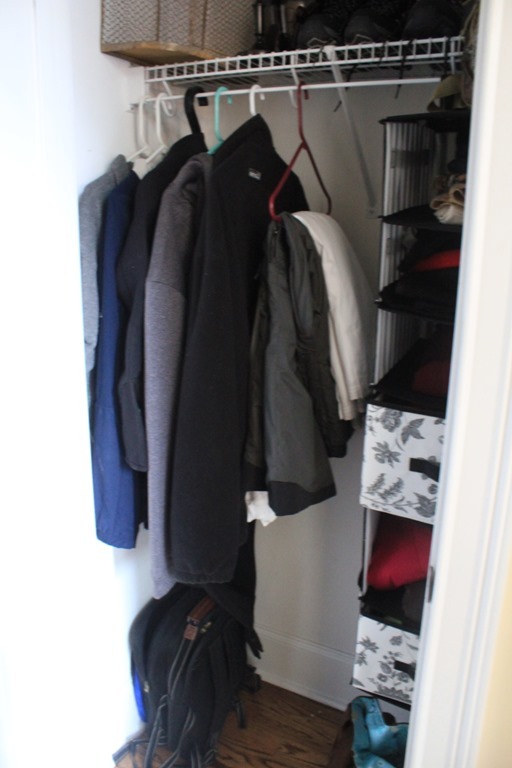 Our closet is L-shaped so we each have a part of the L. It’s almost like having his and hers. It’s not the closet of my dreams, but it’s the closet of “right now” and I’m so happy that it is large and neat and organized! Wow, it’s almost like I am getting it together!! 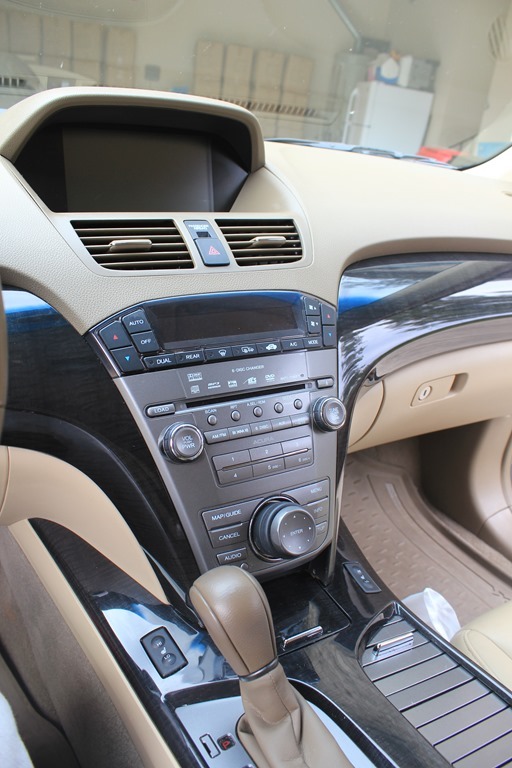 My car is gross. I’m pretty sure there are enough crumbs on the floor to feed my kids for a week. And hair bands, various wrappers and school stuff. Let me correct myself – WERE. 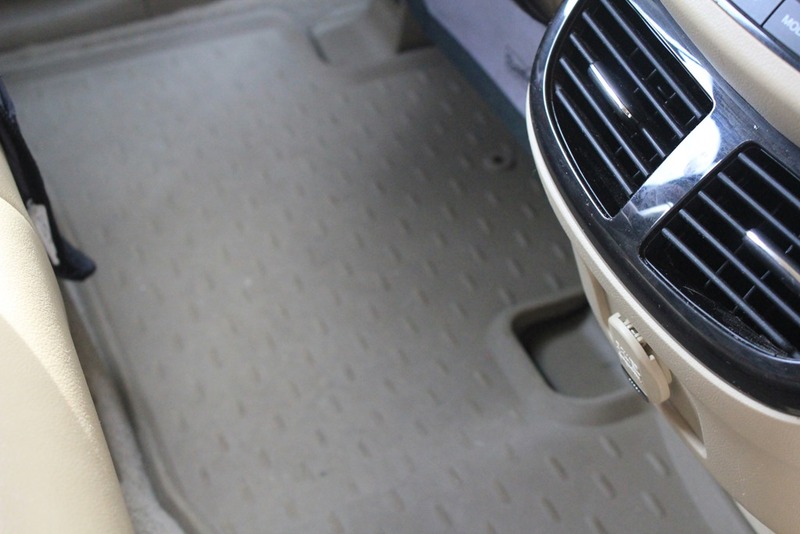 I cleaned and organized the car. Yippee! 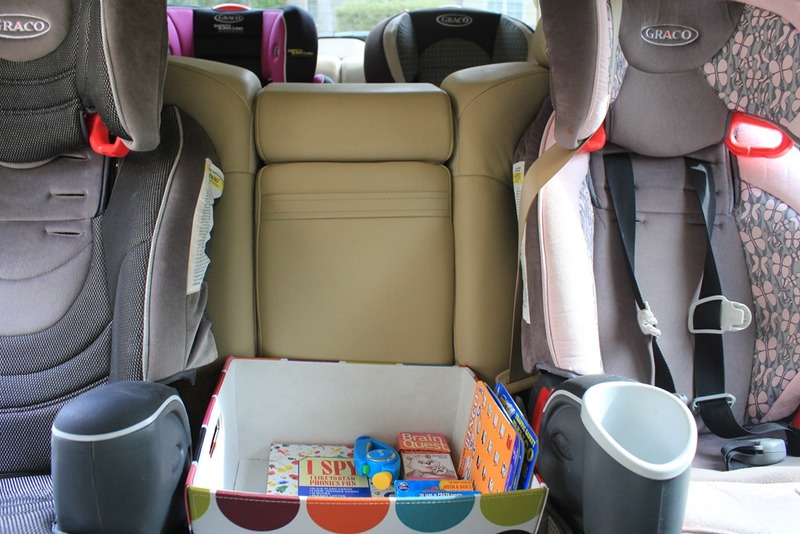 On any given day I could have up to 4 kids in my car. 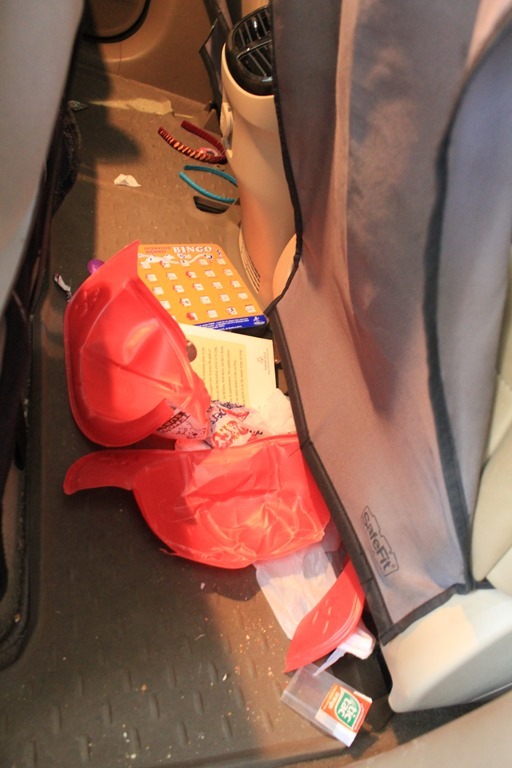 And the ones that don’t belong to me probably go home and tell their mothers how disgusting my car is. Sorry, was. I was embarrassed but never took the time to do anything about it. I vacuumed and scrubbed. I think I filled the garbage can! But now it is clean. My children have been warned.. they must keep it that way!! 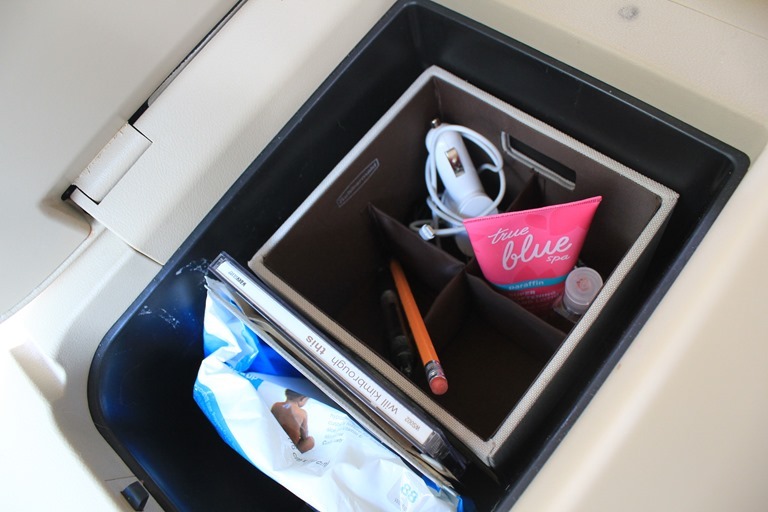 I even went as far as organizing the center console! 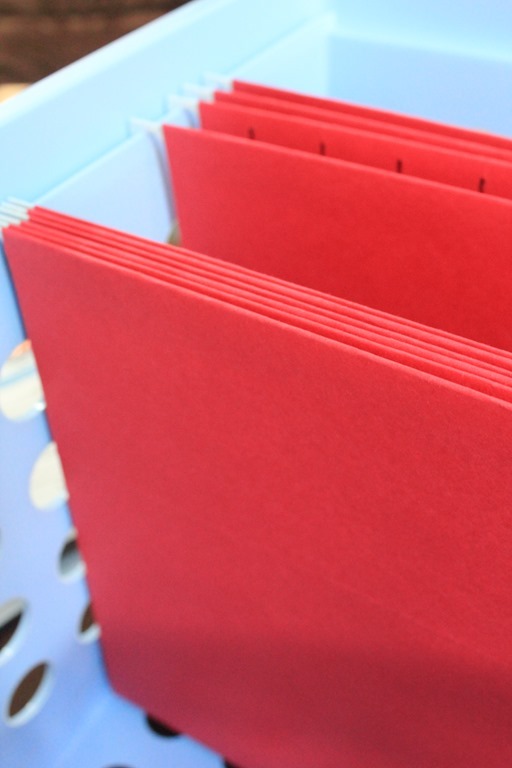 I bought a canvas container from Target that has collapsible compartments in it. Brilliant! Now I can keep the hand sanitizer separate from my car phone charger. And… I bought some car games and contained them in another canvas container from Target. I just felt like every time my kids were in the car they were glued to their iPads. 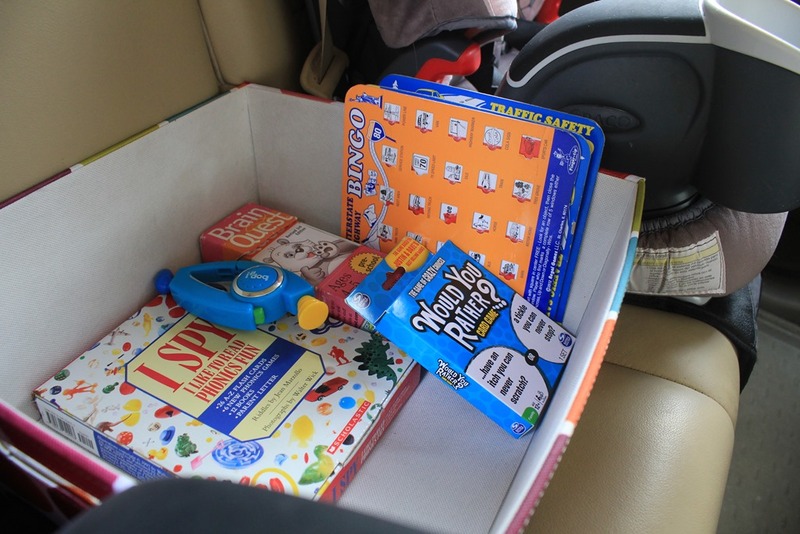 Now they have a mini Bop-It game, car bingo (yeah! remember that one? ), and some question and answer activities. 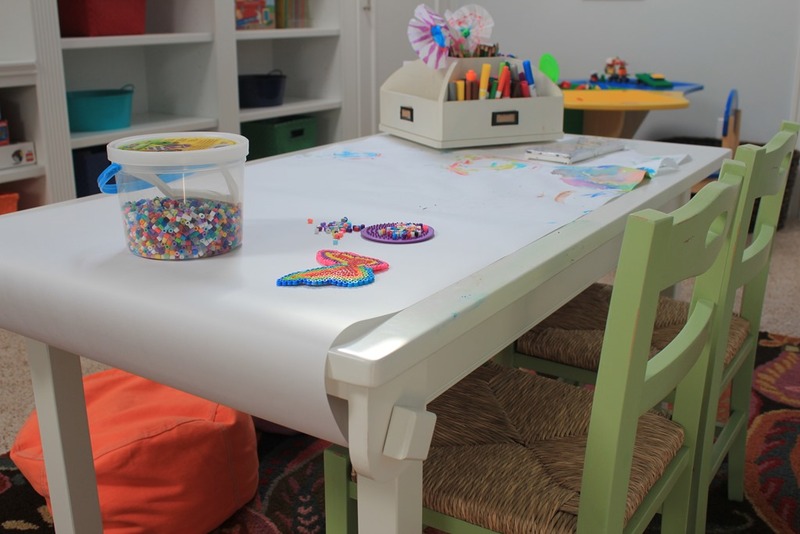 The playroom is bar none, the messiest room in the house. 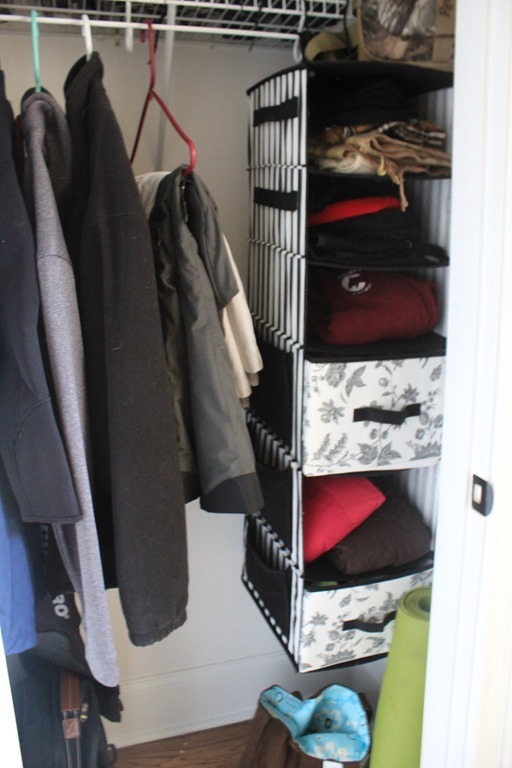 I have so many storage ideas and solutions in place there, yet I can’t keep it clean. 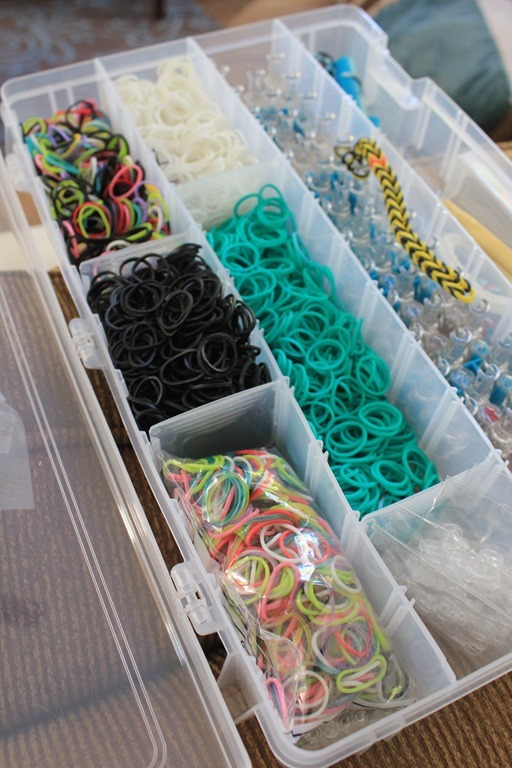 My kids are really in to making friendship bracelets and using the Rainbow Loom. 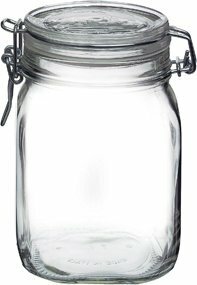 I have found great storage solutions for those. 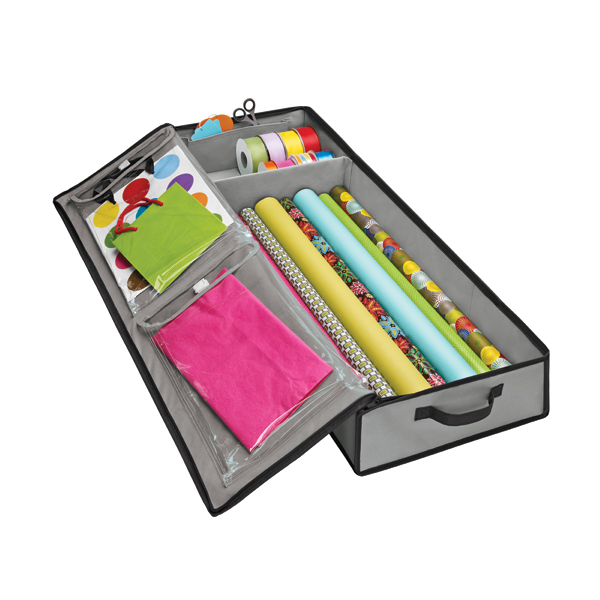 This hobby case available from the Container Store is perfect for craft supplies. 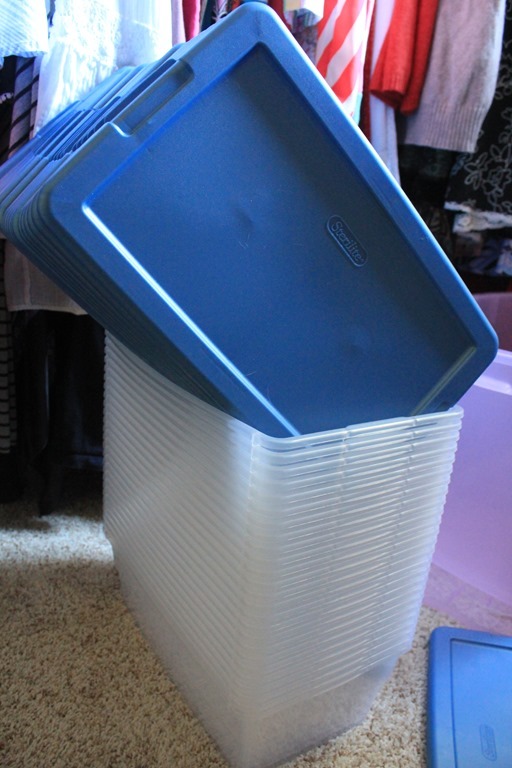 These stackable Fridge Binz from the Container Store are supposed to be used in the refrigerator, but I can see them being very valuable in other places, like the craft cabinet. 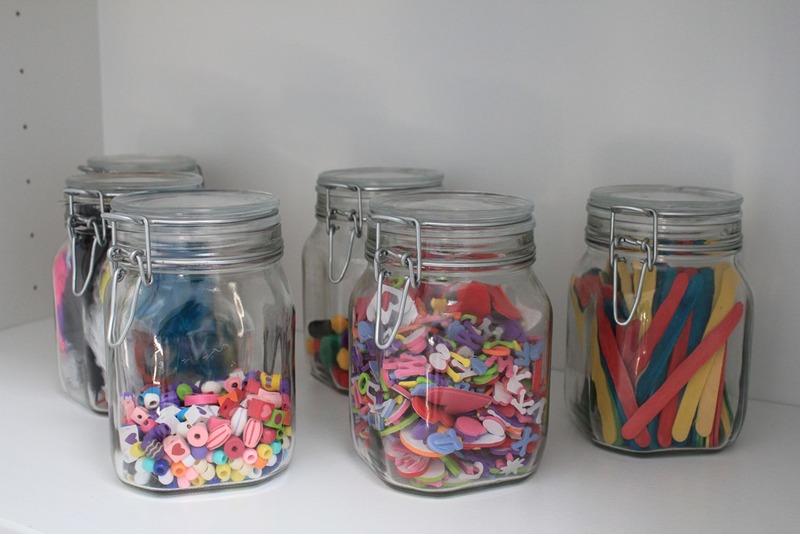 These lidded mason jars hold lots of little craft items like stickers, thread, buttons, etc. 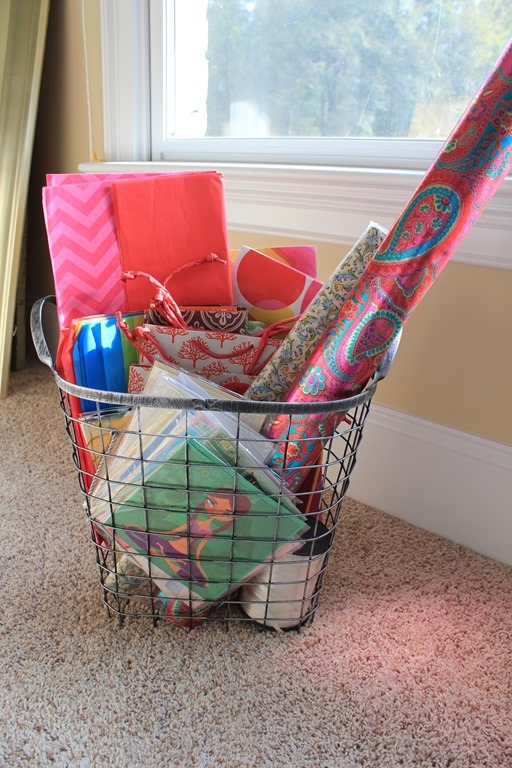 This Wrapping Paper Organizer is brilliant. I really need one. I have wrapping paper stashed in 3 or 4 different places around the house. 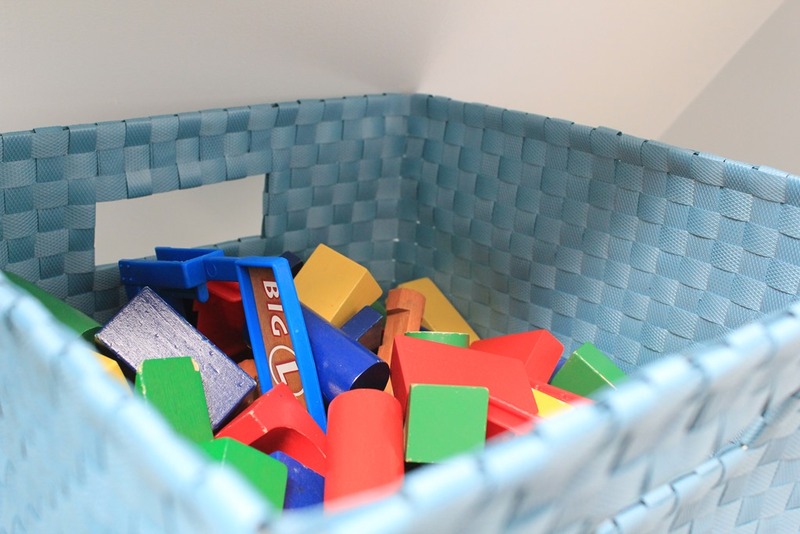 Several of these baskets from Target corral toys and Legos. 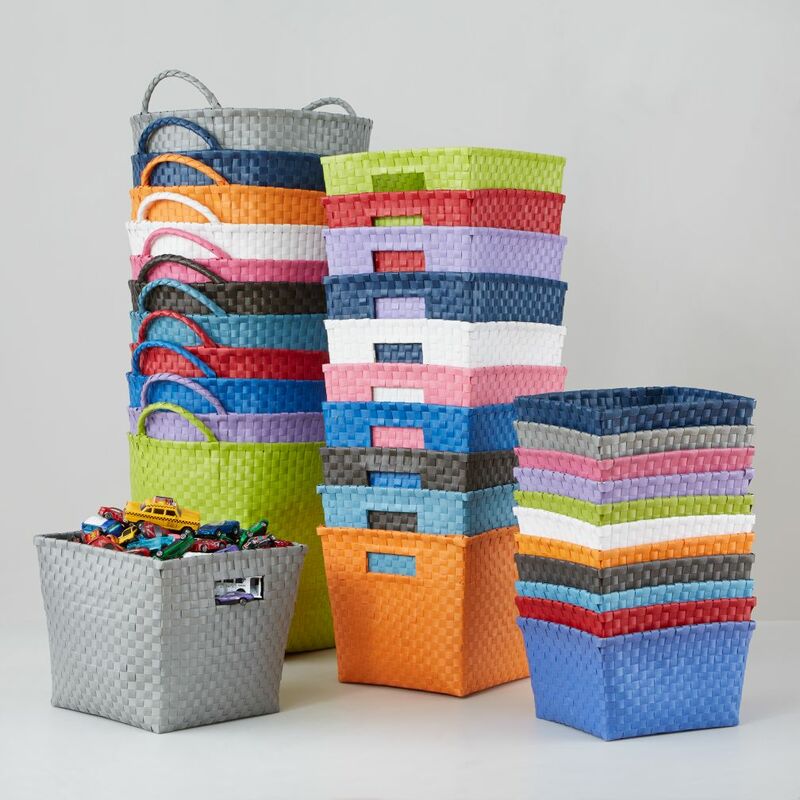 These colorful baskets from The Land of Nod are on the shelves and hold small toys like blocks, Barbies and even more Legos. 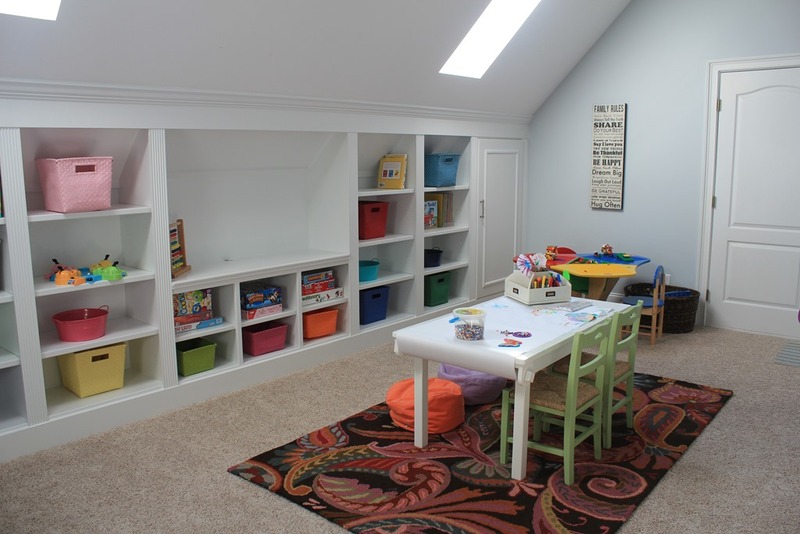 I wanted the playroom to be a place where my kids could create and play. 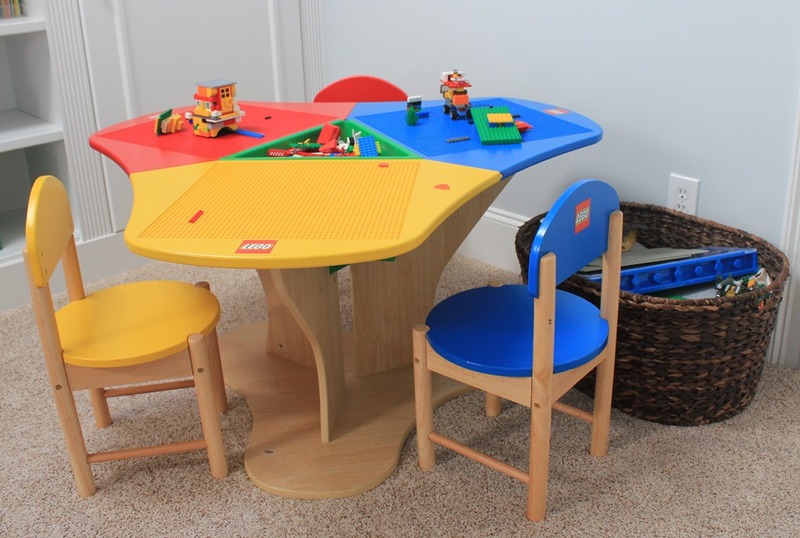 We have a Lego table and a kid sized craft table. 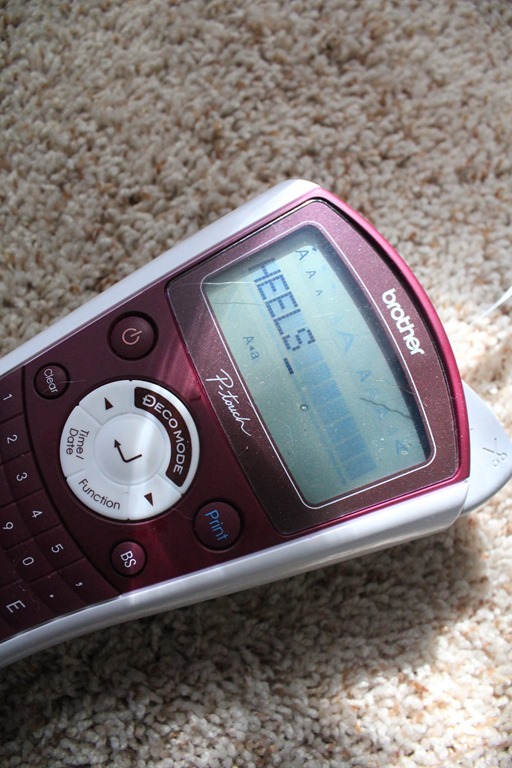 There are usually small objects all over the floor! 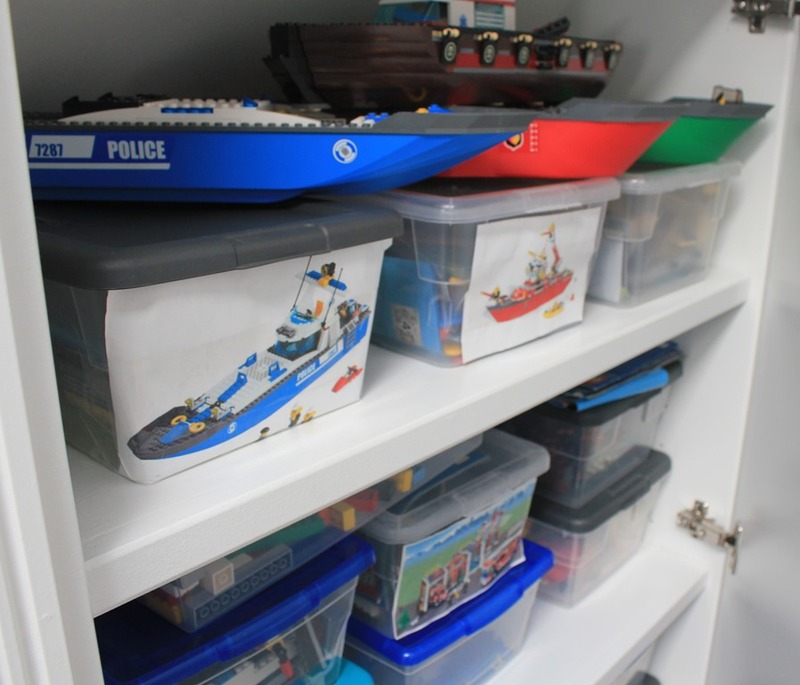 I used those good ‘ol shoe storage boxes for Lego sets. It keeps the sets together. Don’t you just love it when your children come home with a backpack full of artwork they did at school? They are bursting with pride and can’t wait to show you all of their special creations. The difficult part is that all of them are precious and can’t be thrown out. And must be pulled out at a moments notice so you can prove that you didn’t throw them away. If I didn’t create a system for corralling all of this artwork it would be taking over my house. So I created Art Files. 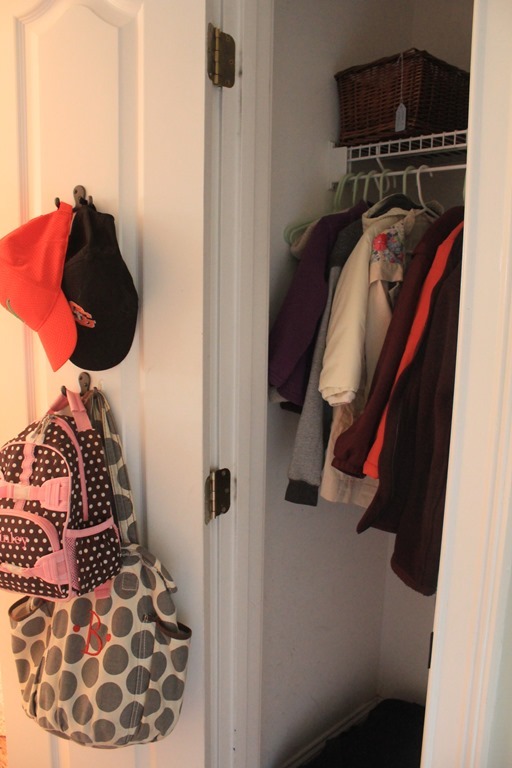 They stay in a hall closet (more on that closet soon) that is easily accessible, they stack on top of one another and they hold all of the important artwork and school work. I bought 2 stackable cubes from Target for about $3 each. 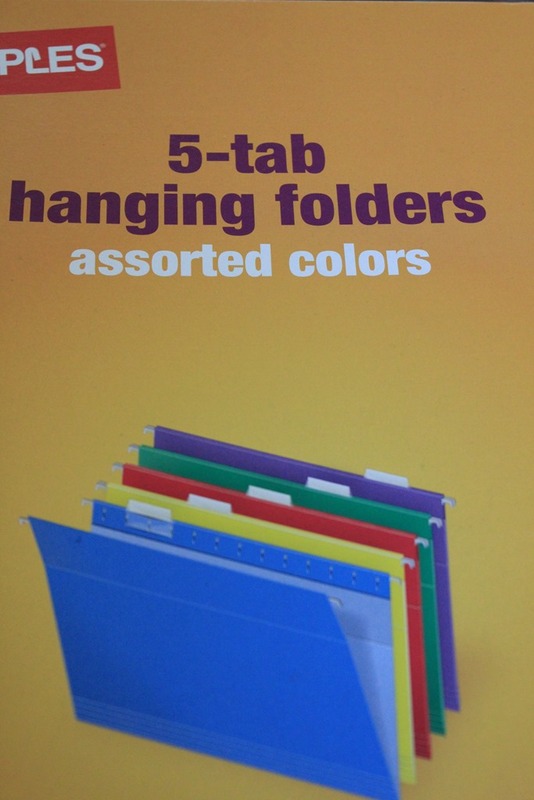 I bought hanging file folders from Staples. 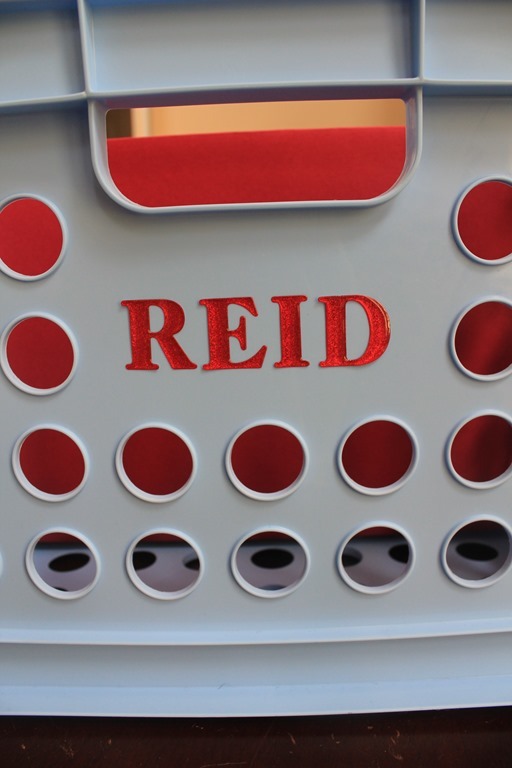 I put their names in stickers on the front of each bin. 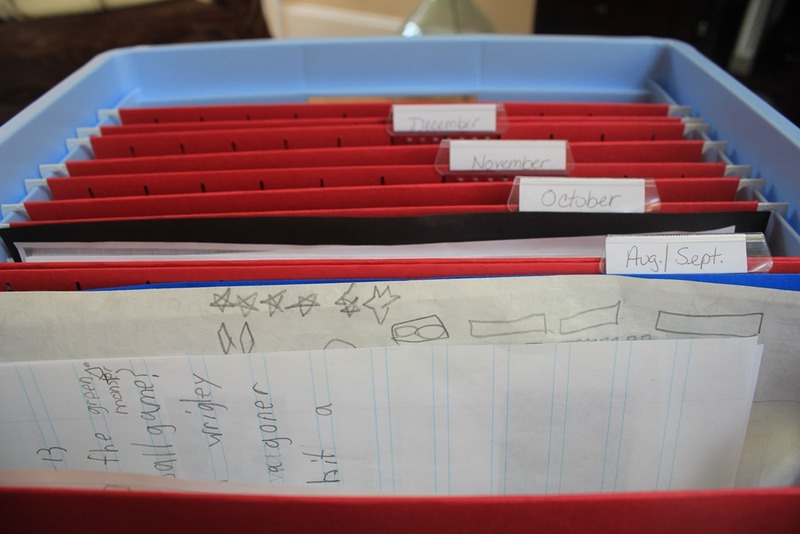 And labeled each folder with the month of the school year. Viola! They easily stack into a corner of the hall closet. 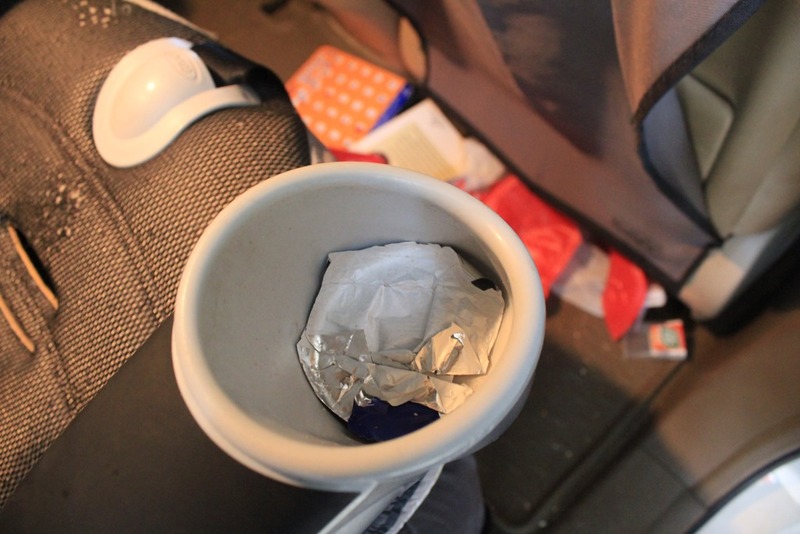 I pop stuff in there that needs to be kept and can retrieve at a moments notice, like a good mom! I have discovered some more key elements. Mostly because this is how I have been derailed from my project. But each time I have a set-back, I learn. That is life. Like most women, I love shoes. 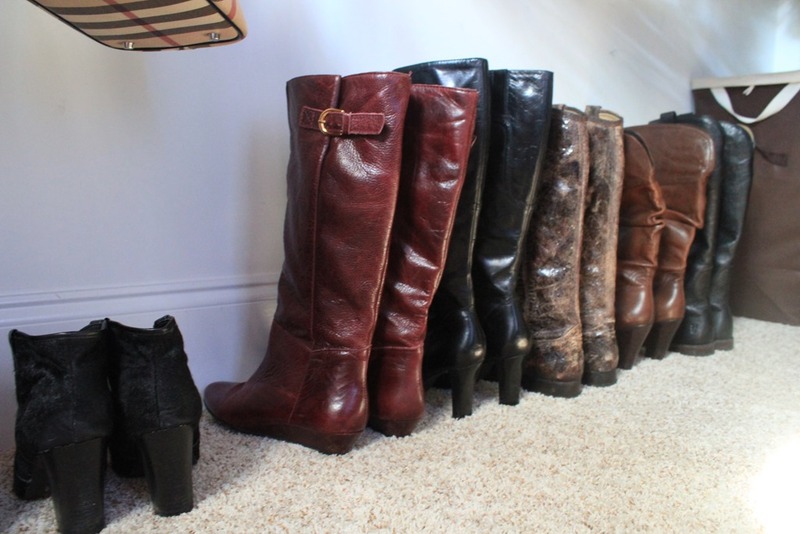 (I’m giddy that it’s boot season!) 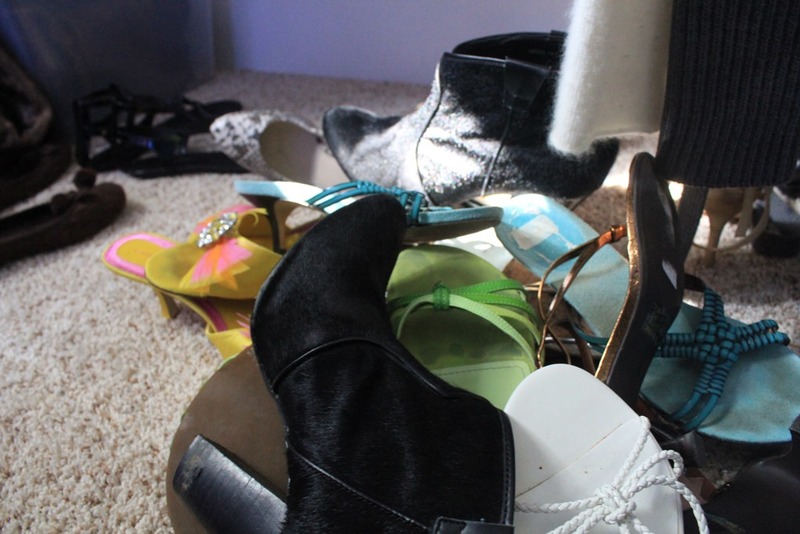 But my shoes were kind of taking over the floor of my closet. Or they were thrown into large Rubbermaid bins. It was bad. 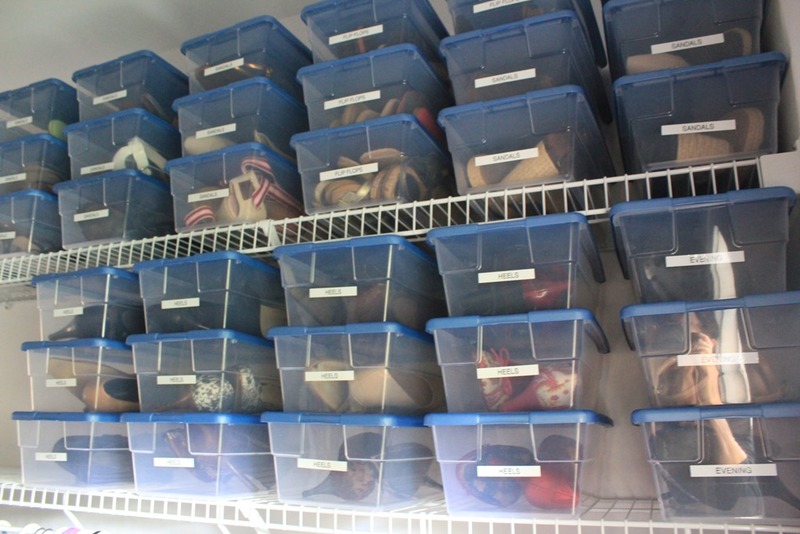 So while over at a neighbors house, I saw ingenious shoe storage! (Thank you Melora and Florence!) 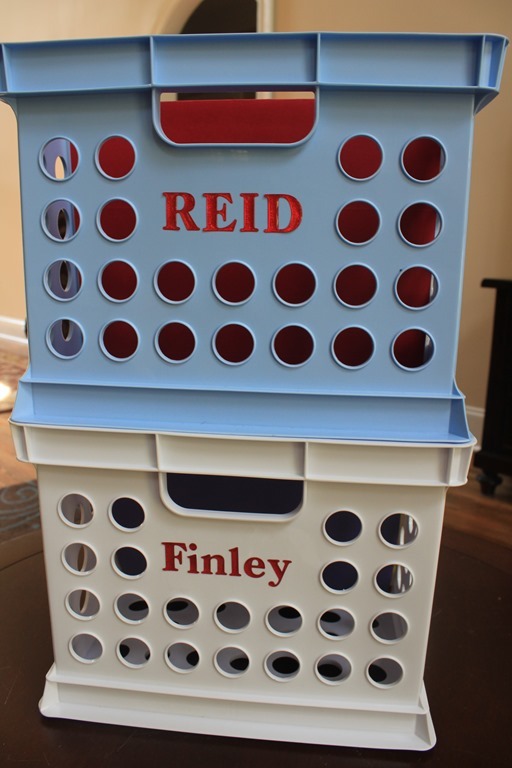 Small Rubbermaid bins. I immediately ran out and bought around 50. I got them all at Target for 87 cents a piece! 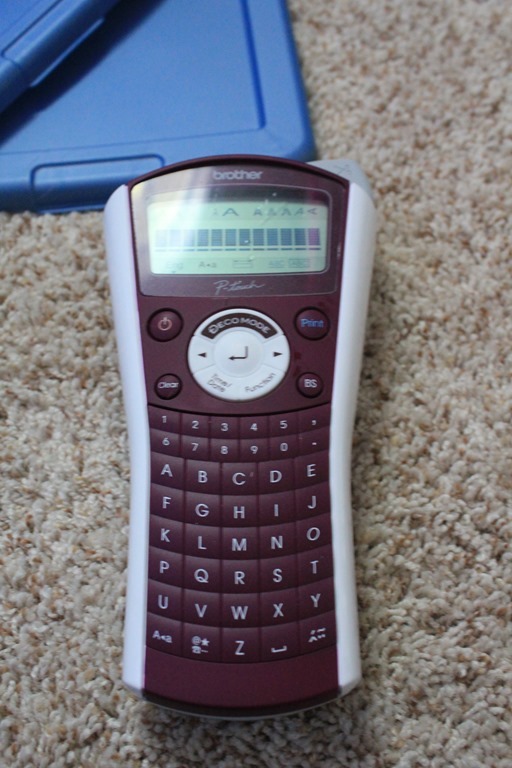 And I grabbed my trusty label maker. I got to work pairing my shoes and putting them in bins. 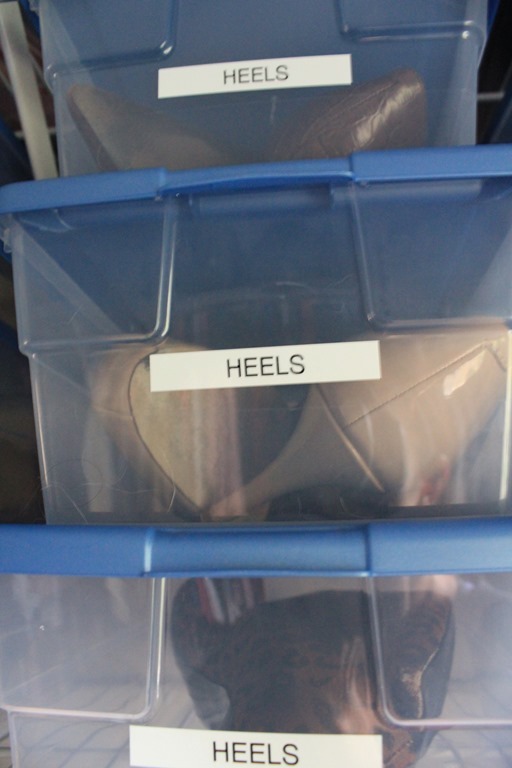 Then I labeled each box with the type of shoe it held. Then I started stacking them up. Out of season shoes went on the highest shelf. Boots were lined up on the floor and flats were lined up on a low shelf. I also saw some amazing purse storage on Pinterest. Are you ready for this? Shower curtain rings! 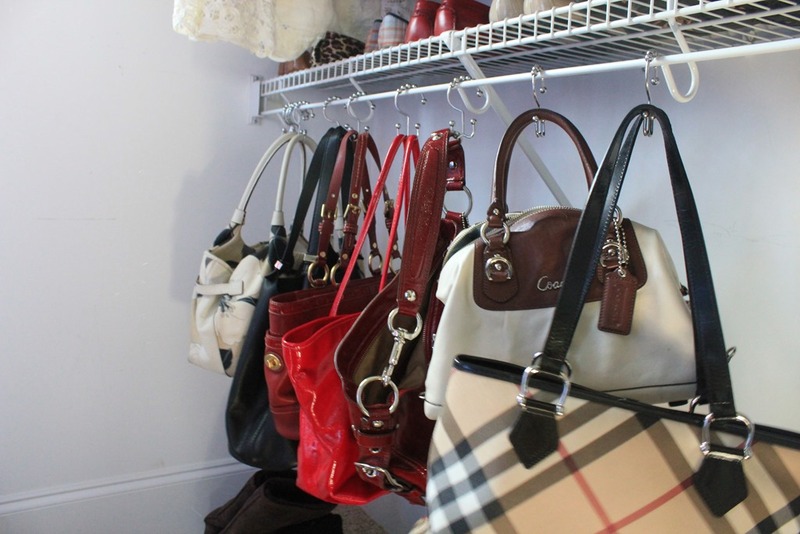 Then your purses just hang right up. I can actually see the floor of my closet!!! Now I just need to get all of the clothing in order. That’s part 2. Today is mostly a day in pictures. I cut my finger and can’t type. 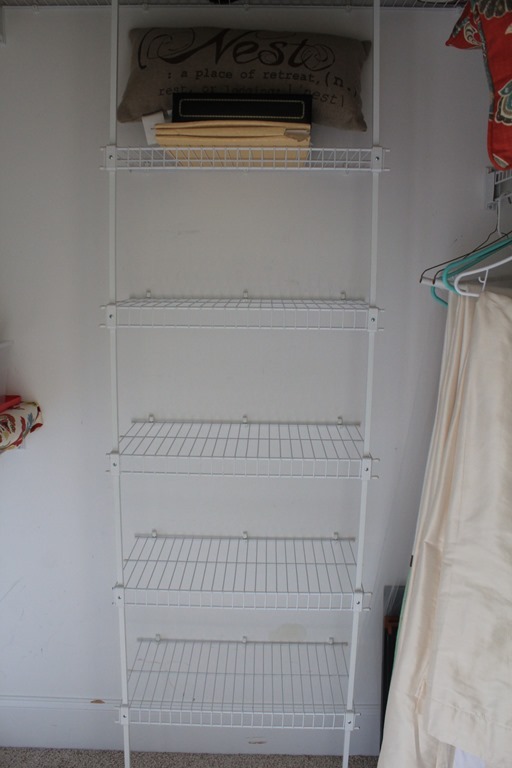 But before the mishap, I did manage to do the two coat closets. 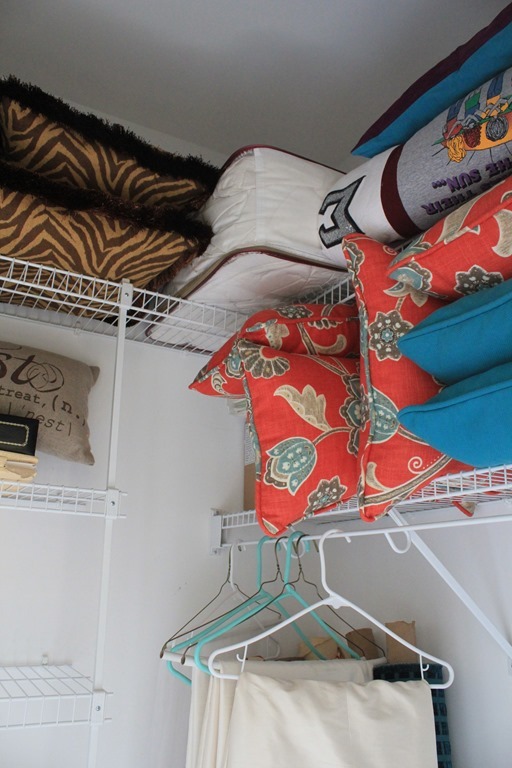 The first one is right by the “drop zone” and houses the most often used items. 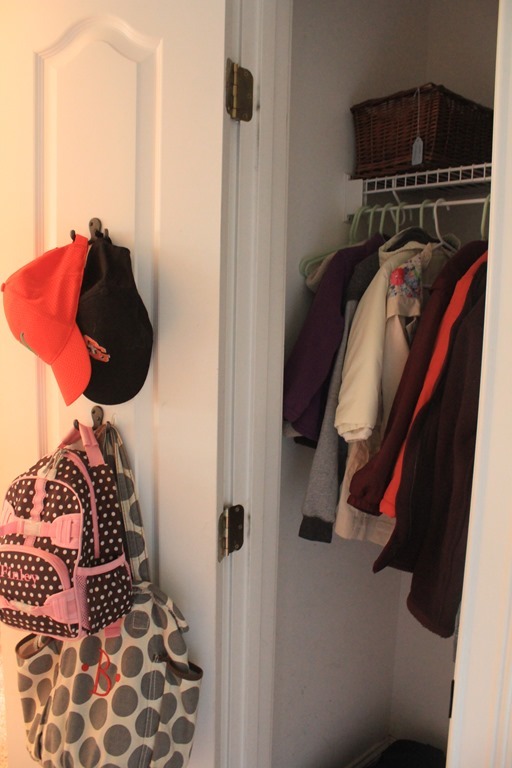 The kids coats are in there, my throw on coats, dance bag, baseball bag, gym bag, etc. 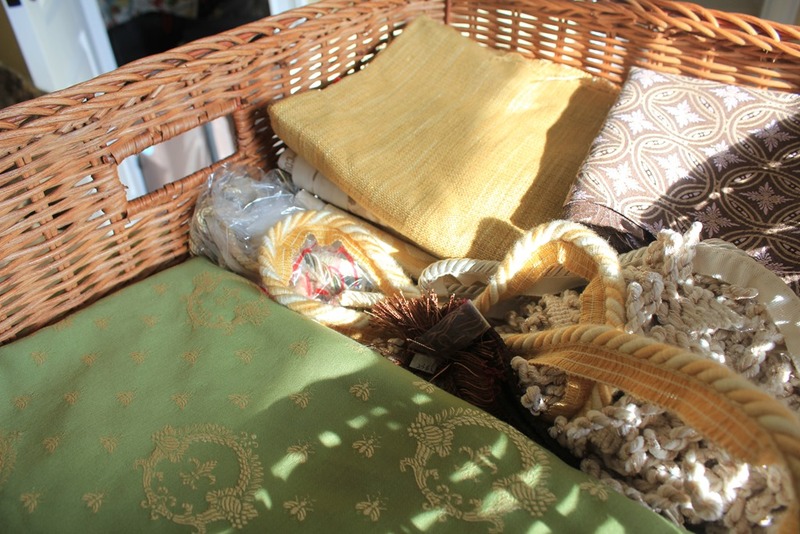 There are baskets for corralling mittens and hats. 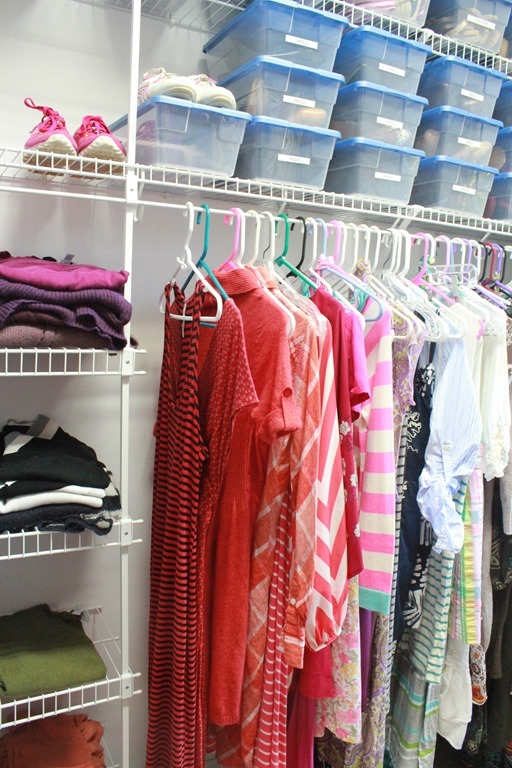 This closet is the closet for less often used stuff. Heavy winter coats and snow gear, for the 3 times a year it snows here, our picnic backpack, and other winter odds and ends. 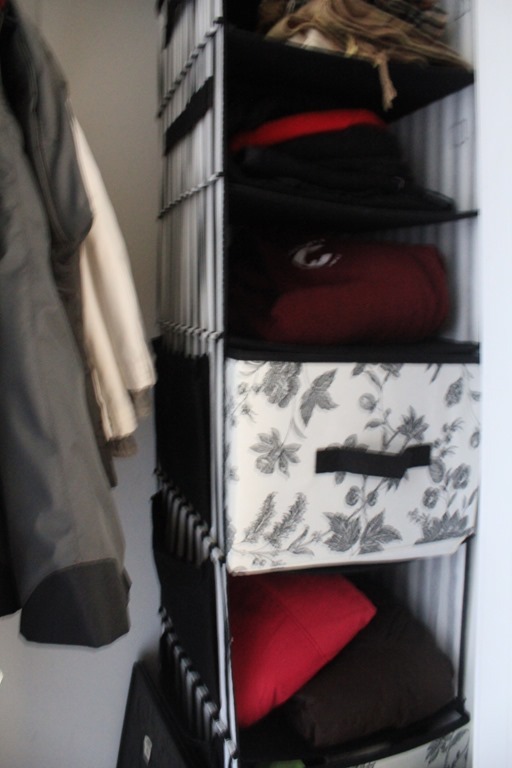 The hanging organizer I got from IKEA. Yes, there are many places in my house that lie behind closed doors and I hope that outsiders never see them. Most of them are closets. In this 31 Day series I vow to get it together. That means organizing, goal setting and follow through. 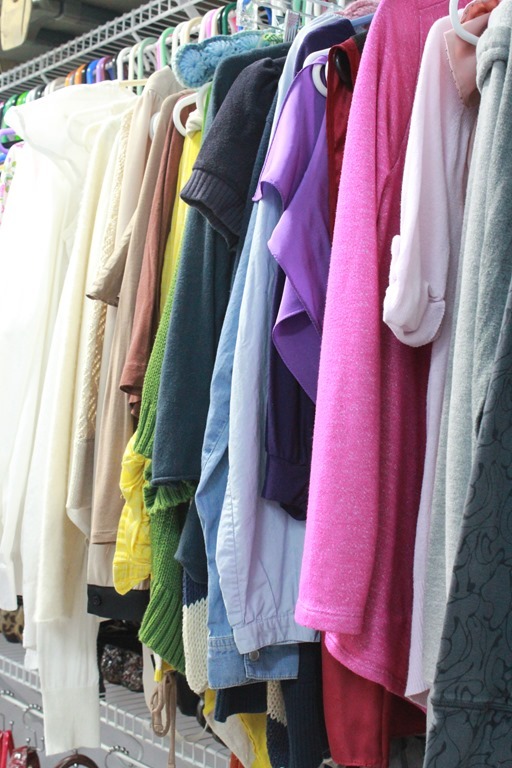 I decided to tackle one of the messiest first – the linen closet. 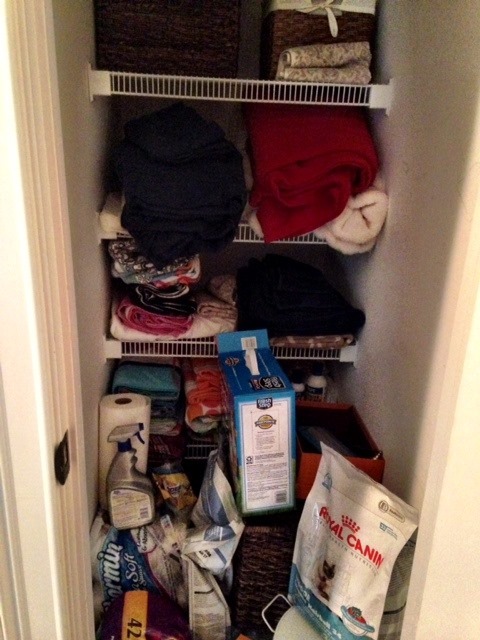 It was a jumble of blankets and towels and cat litter and toilet paper. It is a very deep closet so I can honestly say that I was not totally sure what was back there. 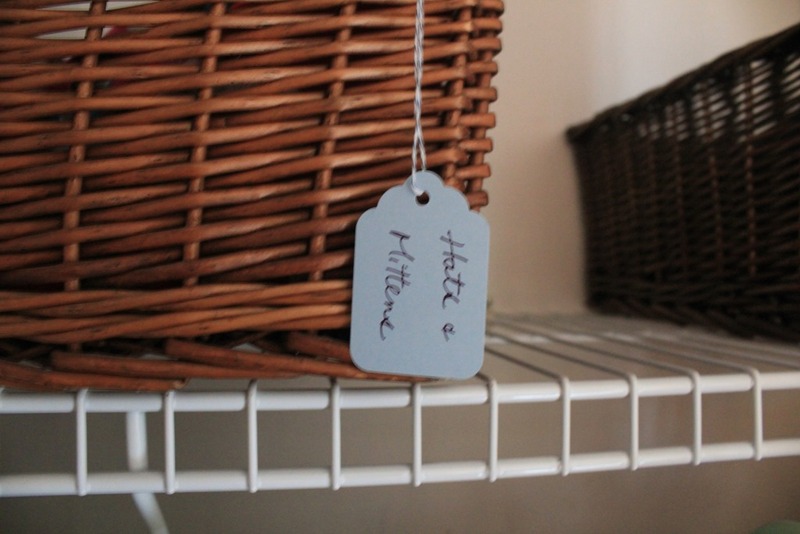 I grabbed my baskets and tags. I yanked things off the shelves. I folded. I tossed. 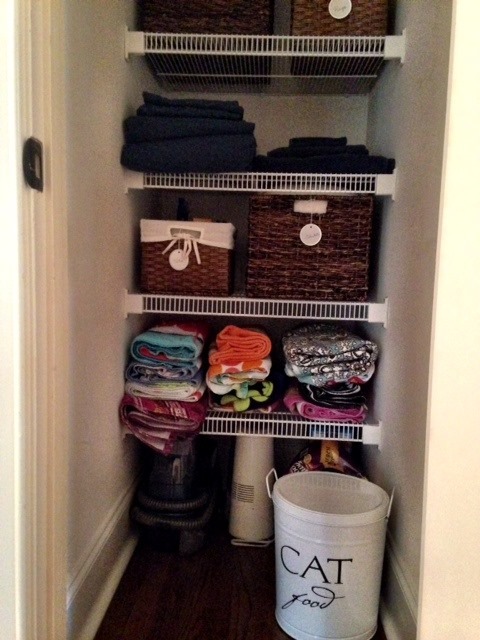 I now have a very organized linen closet!